The CoffeeShop Blog: CoffeeShop "Vintage Bliss" Photoshop/PSE Action and Linen Texture! CoffeeShop "Vintage Bliss" Photoshop/PSE Action and Linen Texture! 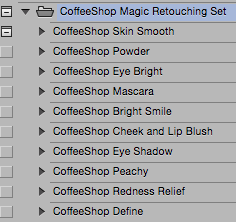 Before I discuss my newest free action, I wanted to mention my "Magic Retouching Makeup Kit" action set. 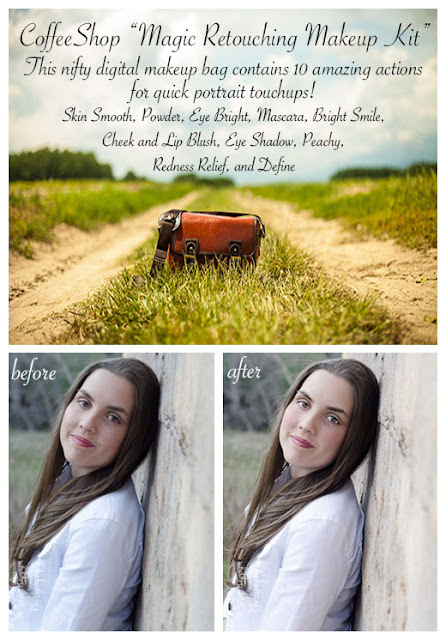 I have so many portrait retouching actions posted on this blog, but I had some readers mention that they would like a digital make-up kit that would allow them to just do a few touchups on a portrait rather than run a huge action. A special thanks to Bobby for allowing me to use this portrait for my before/after example. So I created this new set of ten individual custom retouching actions and am including them as a special gift with all purchases of my CoffeeShop Action Download Pack. This month I am also throwing in my $25 Ultimate Watermarking Action Kit (the only action set I sell) for free. Purchase of my download packs not only save you time, but support this site and allow me to keep designing and posting freebies, so thank you! Today I am so excited to post my newest fine art action called "Vintage Bliss". 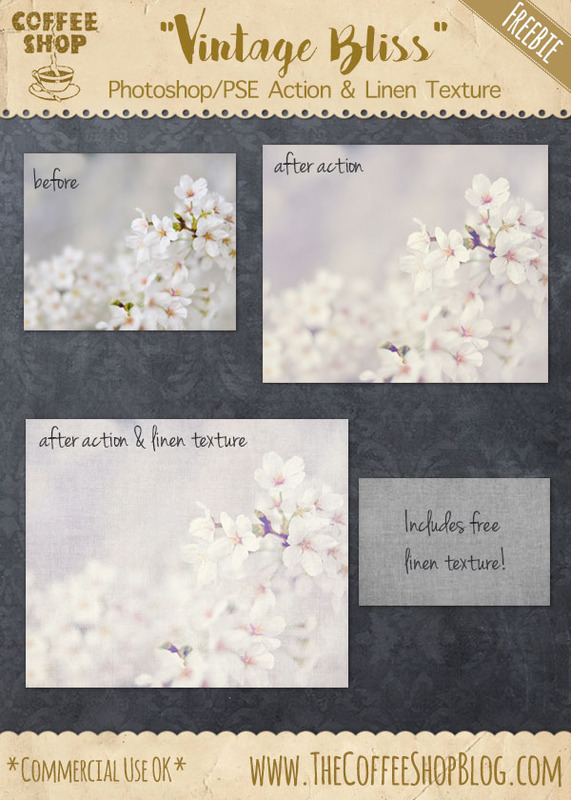 This action gives your image a soft vintage tint and comes with an optional lovely linen texture/overlay that you add after the action finishes running. On the right images this edit can be so soft and beautiful. 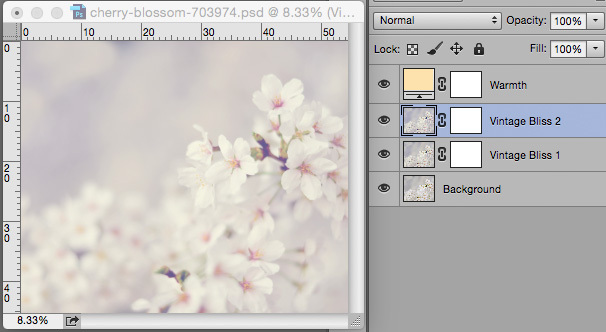 And like most of my actions, "Vintage Bliss" is completely adjustable so you can get your perfect edit every time. This is the beautiful original image, cropped and cleaned up a bit. This is what it looks like after the action finishes running without any adjustments. I turned on the Vintage Bliss 2 layer and kept it at 100%. 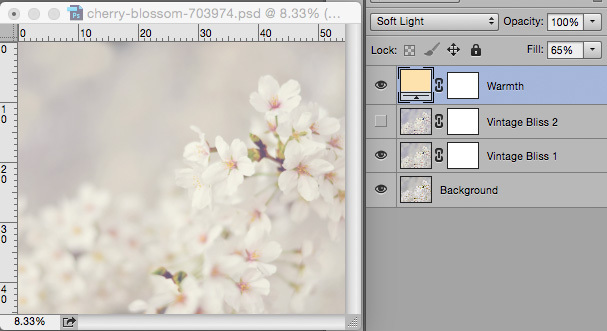 I then added the linen texture included in the download on top and put it in Overlay blending mode. 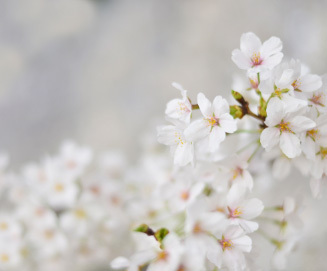 Here is another example on a gorgeous image from Bloom. 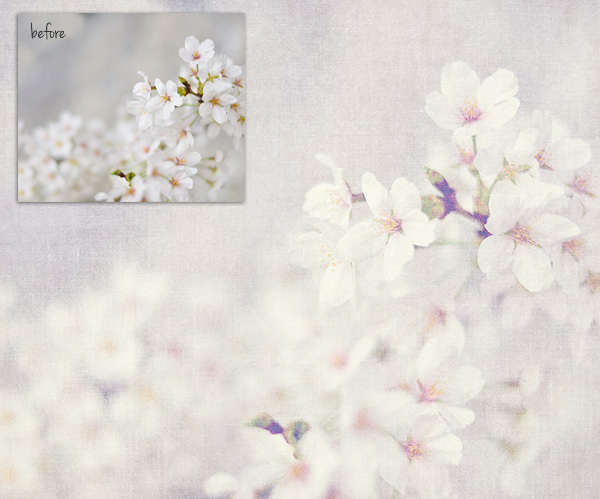 I think this type of edit would be beautiful on greeting cards or on the wall. I would love to see your edits on my Facebook page! 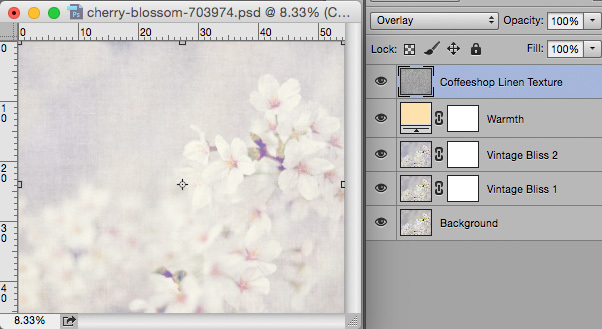 Download the CoffeeShop "Vintage Bliss" Photoshop/PSE action and linen texture. You can also download it here. Thanks Rita. 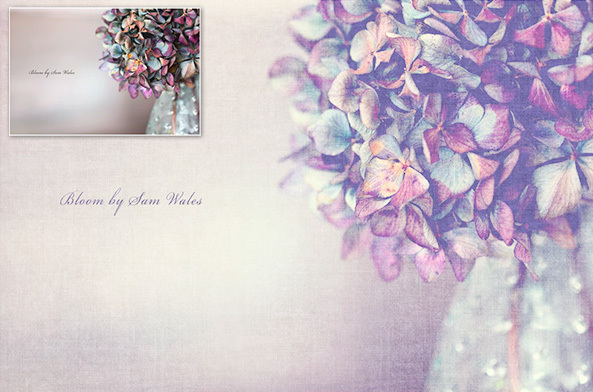 Another beautiful effect, love that linen texture. Pretty base pic too. Where do you save the linen texture? I copied the .atn and .png to "photo effects." Do I copy the texture there too?